Its the time of the year when the weather changes and there’s a good chance you can become sick. If you’re working or going to school, missing days might be detrimental so I would like to share some home remedies to get you up and running again at 100%. 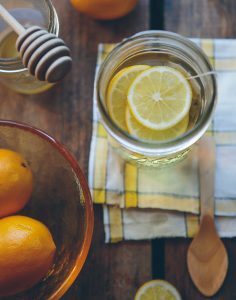 Honey is a key ingredient in throat soothing remedies. With antibacterial properties, honey can react as a hyper-tonic osmotic, which means it can reduce swelling and inflammation. Honey has been proven to have a better result on a sore throat than most over-the-counter medicines. This one sounds a bit nasty but apple cider vinegar has been proven to help clean out the gunk caught up in your throat. All you have to do is add a couple teaspoons of vinegar to a warm drink like tea and drink it. The bacteria fighting properties can be used to kill anything bad that might be floating around in your mouth. Why does it seem like all the weird things can heal your throat? The next item on our list is warm salt water. This home remedy has been around for ages. All you have to do is mix a teaspoon or 2 of salt in warm water and gargle with it. Do this about 3x a day when your throat begins to swell. The salt is acting as sort of a magnet with the water and helps pick up strands of the “virus” and wash it away with the gargle. Some throat sprays and cough drops help with the soothing of the throat like Recolas. You can also try using a Vicks Vapor Rub to put on for instant relief. Are you a person who likes a hotter experience? Well, I have the perfect recipe for you. Putting a little bit of cayenne pepper and hot sauce mixed with water will clean your sinuses out like that. It’s important to maintain your health in all walks of life. Insurance is one way you all able to stay on top of things. Since insurance is often times overwhelmingly confusing, we want to shed light on this industry by answering YOUR questions. So if you have any questions or concerns, comment below and your question may be the topic of our next video! ← What Is the Tax Cuts and Job Acts?